By unanimous vote, the Johnston County Board of Education has selected Dr. David Ross Renfrow as the district’s new superintendent on Nov. 16. Prior to this post, Renfrow served as the inaugural principal of the new Corinth Holders High School from 2009 to 2012 in Wendell and as principal of North Johnston High School in Kenly for six years. 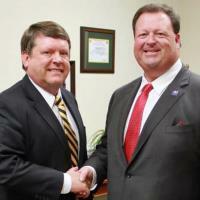 Dr. Renfrow will assume his duties as JCS superintendent on March 1, 2016.